Last week I was contacted by the folks at SailBlogs.com. They have a really nice service allowing sailors to set up their own blog to document their travels, put up pictures, set up templates, put up short videos, map your position, use e-mail to post on the blog, and now post your position in Google Earth. The basic features are free, more advanced features (like mapping, e-mail posting, and videos) require a premium account which costs a small monthly fee. They have a network link for showing the positions of those boats who report with a photo of their boat (if they choose), and a link to their blogs. Even if you are not a sailor, you might want to download the network link for an area of the world you're thinking of visiting and check out what a sailor there thinks of the area, and see the photos they have taken. If you are a sailor, you'll definitely want to check it out and tell your other sailing friends about this fast and easy way to document their travels. You can also take a look at where boats are choosing to anchor or what marinas they are using with a closeup view of a satellite photo in Google Earth (when available). You also might want to check out the ongoing 5th leg of the Volvo Ocean Race in Google Earth. 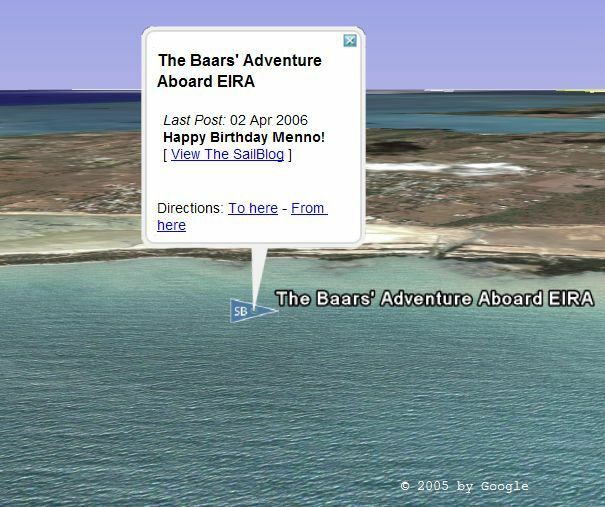 Just for fun, can anyone tell me where the above screenshot was taken in Google Earth? Of course, it would have been easier if they were placing KML links next to each entry... or if there was only one place called La Parguera in PR. ...and a bit further south to see the balloon.